Promotional tables are ideal displays for any trade show, traveling exhibit, or in-store display. Use these promotional tables to distribute samples, demonstrate products, or hand out literature. They come with custom printed full color high resolution graphics on the side panels and a header sign on top. This creates a full color graphic display that is great for drawing attention at marketing events. Our promotional tables are made out of lightweight materials and assemble in minutes without any tools. The header connects using two poles that slide through holes in the countertop. 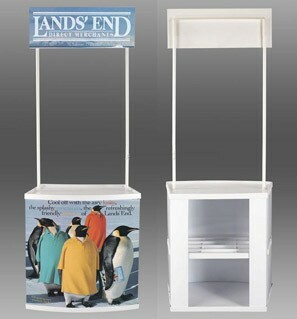 Two internal shelves are included to give the promo stands support and provide storage space. Each shelf can hold about 10-15lbs of evenly distributed weight. Our standard plastic promotional tables are made of corrugated plastic for great support and durability. The promotional tables include carrying bags for easy portability and storage.